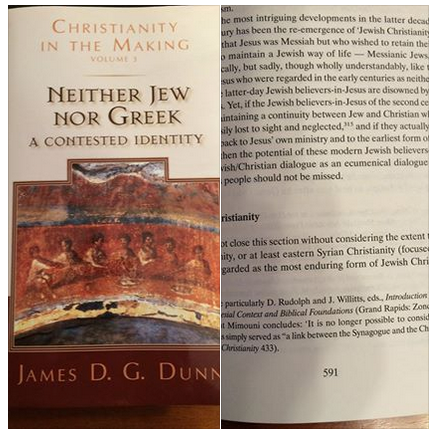 I just returned from the Society of Biblical Literature conference in Atlanta and was flipping through a new book by James Dunn when I noticed the below discussion of Messianic Jews and footnote. Little by little, our little community is being recognized and appreciated. Although it’s more or less common for people writing from within the Messianic Jewish and Hebrew Roots movements to cite Christian scholarly sources, you don’t often find those sources acknowledging the existence, let alone referencing Messianic Judaism, and scholarly volumes written and edited by Messianic Jews. On the other hand, James D. G. Dunn has written on The New Perspective on Paul, so I would expect some overlap on viewpoint. Today’s missive is intended to be brief. I just wanted to share this small mention of the Rudolph and Willitts volume in Dunn’s latest book, a volume which I reviewed in-depth (just search this blog for “Introduction to Messianic Judaism” to find all of my review articles). Messianic Judaism is gaining some credibility, if not within the “average church,” then at least from one Christian scholar and researcher.